When did granite countertops become the single, reliable standard of luxury in the home? 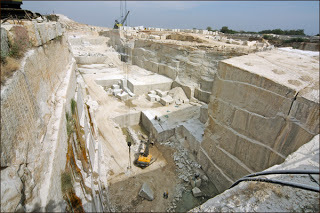 The Marble Institute of America acknowledges that demand for granite has increased tenfold in the last decade, to capture about 33% of the entire market. They come from exotic locales around the world, from 60 countries including Africa, Asia, and South America. We may know of the white marble from the Carrara mines in Italy, but there are blacks from the U.S., pinks from Norway, blues from Brazil, and silver from the Ukraine. Granite is a dense and coarse-grained stone formed in the continental plates of the Earth, and crystallized from magma. It is the most abundant “basement” rock on the globe, underlying the sedimentary veneer of the continents. Some samples may be 600 million years old; stone is not considered a “renewable” resource. Granite may contain uranium, depending on its source and the composition of soils and elements that are present. 55 samples tested by researchers at Rice University found allsamples emitted radiation at higher-than-background levels, and a few tested at 100 times the amount found in other materials (New York Times, “What’s Lurking in Your Countertop?”, 24 July 2008.) The additional exposure of granite emitting a high level of radiation, in close proximity for 2 hours a day, could supply a dose of radiation of over 100 millirem in a few months; about equal to the annual dose set by the Nuclear Regulatory Commission for people living near a nuclear reactor. The average person is subject to exposure of about 360 millirem per year. Radon is the second-highest cause of lung cancer in the U.S., following cigarette smoking. The potential hazards of granite extend through mining and manufacturing. Granite is extracted using explosives placed into a regularly-spaced series of holes made either with a stone-cutting drill, or using a flame torch to create slots, or a high-pressure water jet. The rock fractures into blocks, which are cut with into slabs, usually about 4’ x 8’, similar to other building materials. Each slab may weigh up to 1000 lbs, and slab edges may still show a perforated edge from the blast extraction. The stone is often worked further with CNC mills and diamond-wire saws to make shapes, rounded edges, or specialty cuts, each resulting in additional cost and waste. The factories working with granite are most often located overseas, without the protection of Occupational Safety laws to ensure safe handling and respirators. The chemicals in its composition – 72% silica, 14% alumina, and trace amounts of many other elements – are released in cutting and finishing, causing the potential for silicosis, tuberculosis, and lung cancer. The greatest hazard of granite may be in the embodied energy. Embodied energy is the energy consumed by all of the processes associated with the building material, from the extraction to the processing, to the transportation to the installation – the lights, equipment, fuel, etc. Transportation from sources such as Coimbatore, India to a kitchen counter in Dallas, Texas eats up a lot of resources. The typical embodied energy for imported granite is 13.9 MJ/kg; compared with common building materials such as kiln-dried sawn hardwood (2.0 MJ/kg), or cast-in-place concrete (1.9 MJ/kg), the embodied energy is very high. The rebellion against granite should start at home. There are better alternatives for beautiful and durable countertops. Stainless steel has high recycled content, with durability and permeability similar to granite. Paper recycled into solid surfaces has cashew oil binders. Wood butcher block is minimally processed, may be made with no formaldehyde and low-VOC adhesives, and can also be Forest Stewardship Council-Certified, or salvaged wood. Any locally-made material, whether ceramic or glass tile, stone, or composite, will have a lower environmental impact than imported material. Why would any family want a radioactive, disease-inducing, land-disturbing, greenhouse-gas-wasting material in their kitchen and bathrooms, these temples dedicated to the production of wholesome food and hygienic standards? We had better re-examine our current symbol of luxury living, and replace it with a product that is safe enough to eat from.